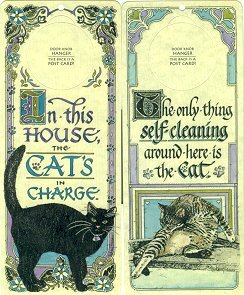 These cat door hangers, postcards or signs are made of cardboard and laminated on one side. The reverse side is a post card. Each is 4" wide x 9 7/8" high. They can be hung over a door knob or posted anywhere you want to make a statement. If used as a postcard, first class postage required. Choose a favorite.